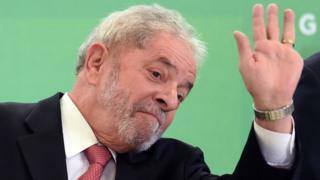 Brazil's ex-President Luiz Inácio Lula da Silva will be jailed while he appeals against a graft conviction, the Supreme Court has ruled. He has a lead in opinion polls. His Workers' Party said the ruling was a "tragic day for democracy and Brazil". Lula watched the ruling at the Metalworker's Union, where his supporters held an upbeat concert. The 72-year-old former president is likely to remain free until paperwork for his arrest is completed. While Brazilians are used to frequent delays and rambling verdicts in their courts, this 10-hour deliberation felt particularly long in this highly charged atmosphere. Lula's legal battles have divided Brazilians and this decision was no different. His critics launched fireworks in celebration. Lula's supporters went home angry about what they say is an affront to democracy and a coup. Lula's critics though see this as a victory. He's a politician who's been proven to be corrupt at the highest level, they say, and deserves to be behind bars - within days that could become a reality, crushing his hopes of returning to power. This has been a massive fall from grace for a man who was once one of the world's most loved politicians. It was a historic day for Brazilian politics too. Lula lost his first appeal in January, when the appeals court not only upheld his conviction, but increased the sentence from nine and a half years to 12. In 2014, after Lula left office, prosecutors started investigating allegations that executives at the state oil company Petrobras had accepted bribes in return for awarding contracts to construction firms. The judge in charge of Operation Car Wash, Sérgio Moro, is expected to issue a warrant for Lula's arrest within days. But this does not necessarily mean that Lula will go to jail for 12 years. He has not exhausted his appeals yet. There are two higher courts which he can still turn to, the Superior Court and the Supreme Court - the latter has only ruled for far on whether he should go to jail pending further appeals, rather than on the underlying case. Neither of those courts would re-examine whether Lula was guilty of corruption. They would look into whether legal procedures were followed correctly and whether his constitutional rights were breached. This process could take months or even years. If either court were to rule in Lula's favour, his conviction could be annulled and he would be released. Under a 2010 Brazilian law called "clean slate law", no one convicted of a crime upheld on appeal can run for elected office for at least eight years. That law would rule Lula out from running for the presidency in October. However, exceptions have been made to the law before. The decision as to whether Lula can stand for president will rest with the Superior Electoral Court (TSE). The TSE will not make a decision on whether Lula can run or not until he has registered as a candidate and he has until 15 August to do so. So we may not know for months to come whether he will be able to stand.